"Bronze statuettes of this type were sometimes purchased as votive offerings by Egyptians before they entered their temples. Once inside the sanctuary, the worshipper would ceremonially present the figure to the deity as repayment for a favor or as encouragement for the fulfillment of a prayer." 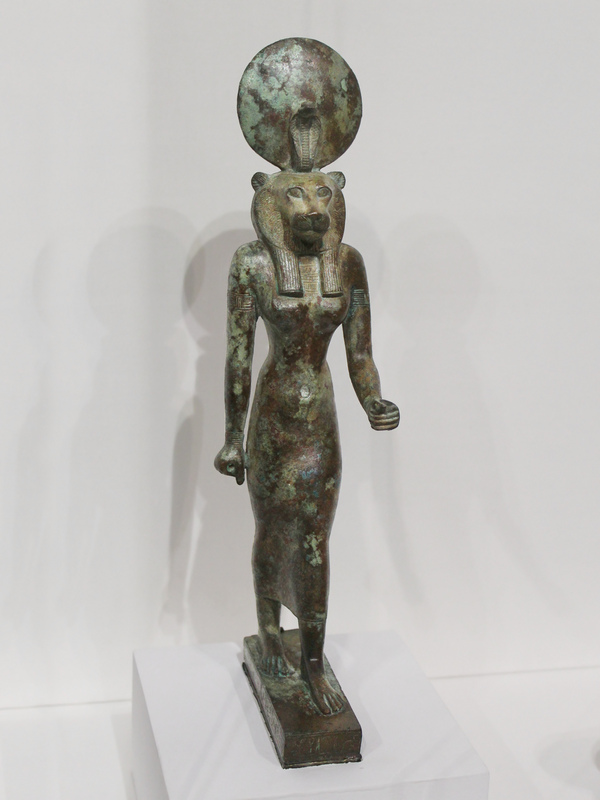 "This elegant striding bronze figure represents the goddess Wadjet, protector of the king and tutelary deity of Lower Egypt. 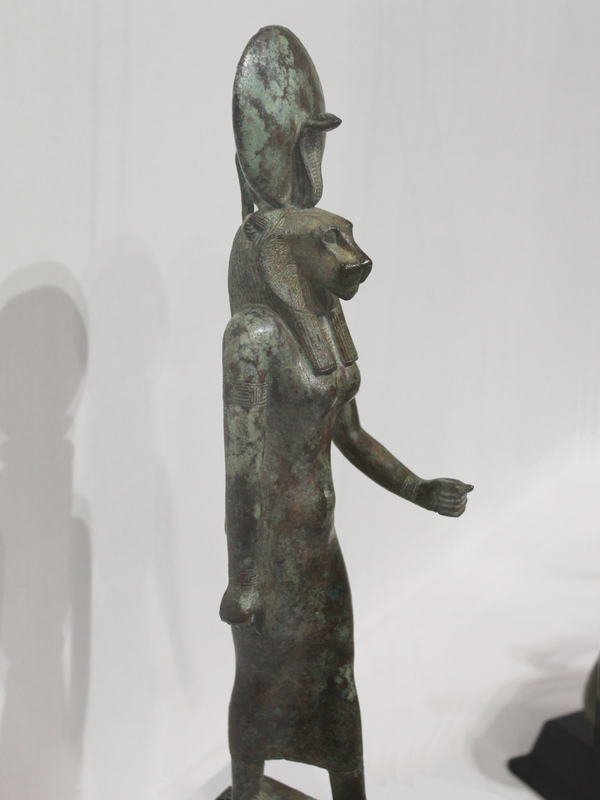 One of several ancient Egyptian goddesses depicted with the head of a lioness, Wadjet is identified in this example by the dedicatory inscription on the rectangular base. 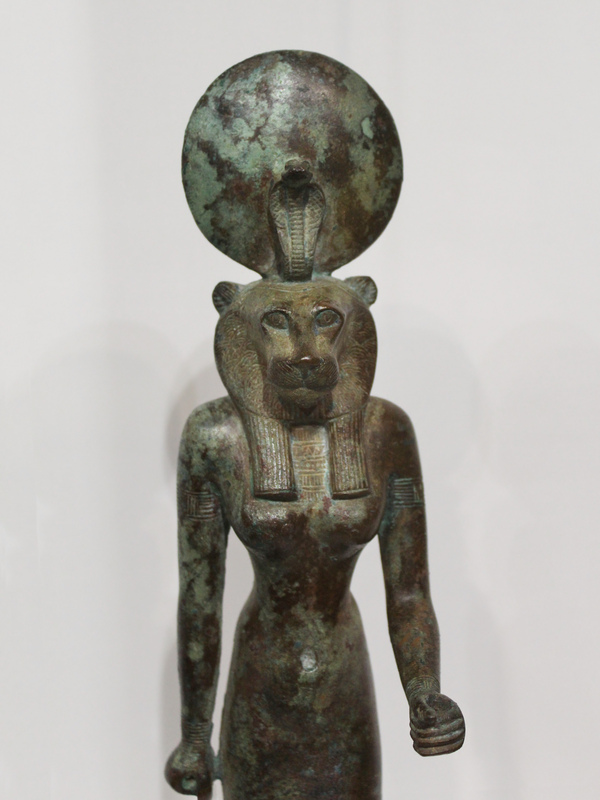 While numerous Late Period Egyptian bronzes are preserved in Egypt and in collections worldwide, this example is particularly fine. The narrow-waisted human figure is treated in an exceptionally refined and supple manner, with the contours of the breasts, abdomen, and thighs visible beneath the thin garment. Incised details such as the patterning of the lion’s mane, broad collar, armbands, and bracelets are carefully rendered. The sun disk and uraeus headdress are intact, while the handheld attributes, probably an ankh and papyrus scepter, are now lost. It is possible that Hearst was attracted to this lioness image, as a full statue and three fragments of a similar deity are incorporated into an outdoor fountain that remains in situ at San Simeon." We are fortunate the museum has provided a photo with lighting that really reveals this fine statue's details. 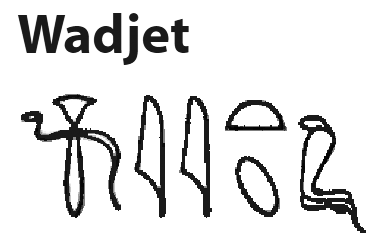 Wadjet's name may mean 'the green or fresh one,' or 'she of the papyrus.' According to one of the Pyramid Texts, she was responsible for creating the papyrus swamps. 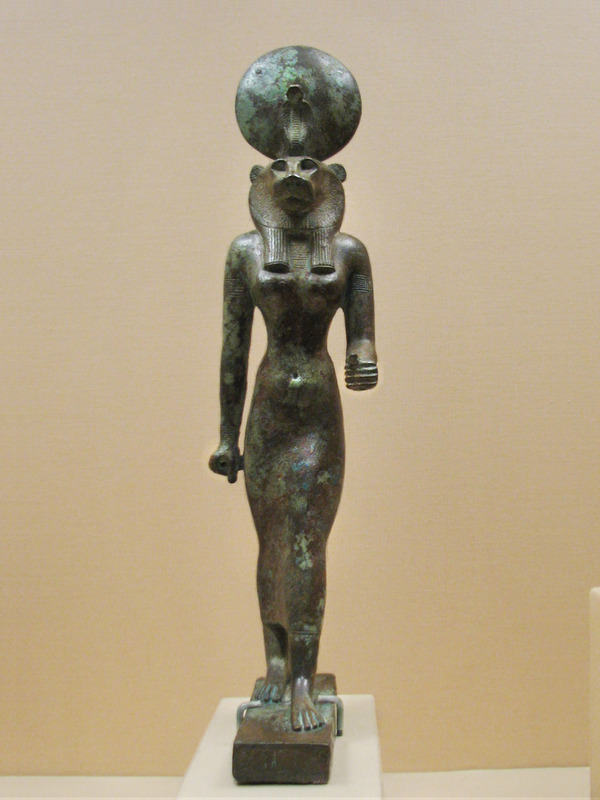 Usually Wadjet is depicted as a cobra, often paired with the vulture goddess Nekhbet, in the 'two ladies' or 'two goddesses title of the king's royal protocol. When she appears in leonine form, it suggests her role as ‘Eye of Ra’. 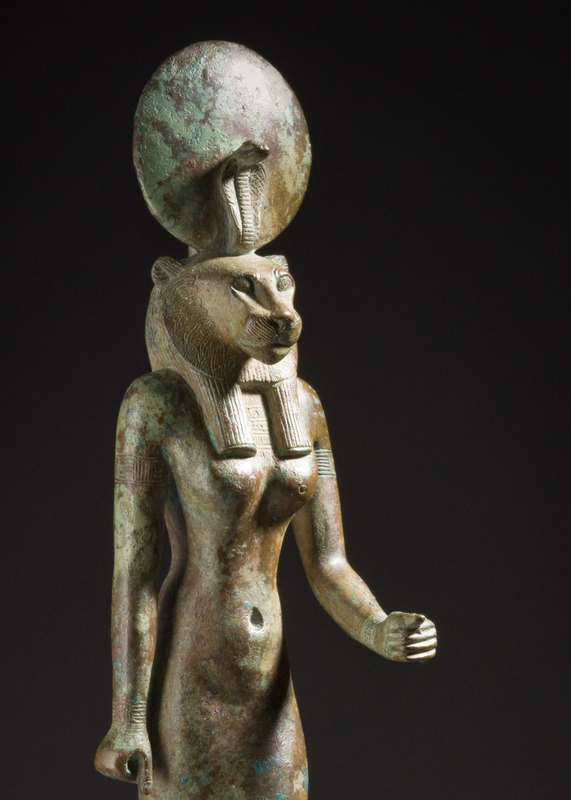 The lionine goddess Sekhmet is also a goddess associated with the 'Eye of Ra'.